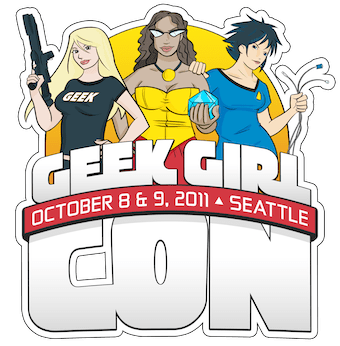 I’ll be at Geek Girl Con this weekend, and hope to see some of you there! With panels ranging from Star Wars to Burlesque to feminism, there’s pretty much something for everyone. Tickets will be available at the door for $30 each day or $45 for a weekend pass, cash only. If you’re in the Seattle area and want to geek it up a bit this weekend, check it out! Otherwise, stop by the blog next week for some updates on some of my favorite folks and vendors. Find more info at their website or follow along on Twitter with hashtag #GeekGirlCon. I’ll be tweeting from my twitter handle (@GeekyHostess) as well.